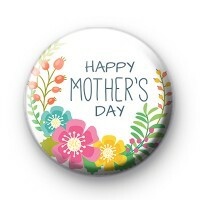 Lovely white 1-inch badge with a bright spring floral design and the message Happy Mother's Day written in a simple elegant font. It's important you let your Mum know just how special she is and what she means to you. What better day to do that than on Mother's Day. Show your Mum she is still number one in your life and you appreciate her.